The secret of success is to understand the point of view of others. Come together is the beginning, stay together is a progress and work together is success. Das Geheimnis des Erfolges ist, den Standpunkt des anderen zu verstehen.Zusammenkommen ist ein Beginn, zusammenbleiben ist ein Fortschritt, zusammenarbeiten ist ein Erfolg. 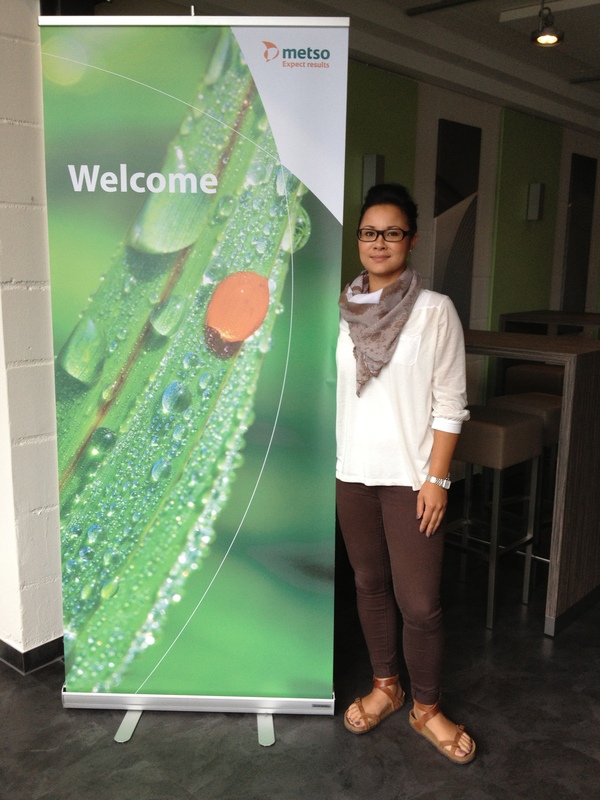 “Helpful colleagues, harmoniously atmosphere and challenging tasks,” sums up summer trainee Mai-Lan Röllig, 28, her experiences at Pfungstadt location in Germany. “This summer I took the opportunity to complete my internship, a part of my study (Bachelor of Business Administration), at Metso Paper Pfungstadt in Germany. The goal of this course is to transfer the theory of studying, in the practice and of course to collect new practical experience in a company that is acting worldwide. Particularly important for me in terms of my specialization in the study, are the areas of HR and Controlling. “My superiors at the workplace are Doris Fischer (HR) and Frank Merl (Controlling). I can learn and support them in their daily work. Pfungstadt has round about 70 employees, which are employed for different areas of Metso Paper. My first impression in the service center was impressive – the very collegial, friendly and helpful atmosphere and the interaction among the employees conspicuous me directly positive. “My reaction to the Metso philosophy, which includes an employee oriented engagement next to other principles, was very positive. Especially when I noticed that this principle of management would transfer into the practice. Here it is clear that through an extraordinary commitment from Metso, the employee satisfaction is a significant amount of success. I learned that this employee satisfaction is supported by the different areas of Human Resources (development, care, management, planning) as well as a positive corporate culture. Particularly in relation to me, I can work every day with friendly and helpful colleagues, who are also willing to share their knowledge with me. In addition my work contents are interesting, challenging and practice-oriented. THANK YOU for this very useful experience that I could make at the internship. A strange man, who's facinated with human mind as many ways as there are minds. Sharing those ideas and thoughts to you, mostly for you to laugh at. Quick mind, even quicker hands and bad sence of humour. Bare with me. Representing myself and my own opinions.